What do I need to do to be able to referee a DeAnza Youth Soccer game: You need to have a current USSF grade 8 (and better) certificate (all referees), plus attending a field clinic (for new referees). Mentor Program: DeAnza Youth Soccer League provides mentors to the new referees and those who wish to improve their skills. You can ask for a mentor, or the referee coordinator can assign a mentor to centain games for all the new referees. 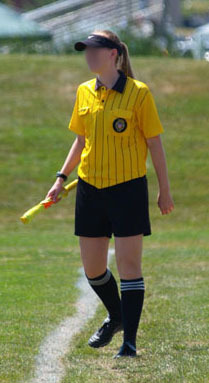 Our mentors are experienced and trained USSF referees who have refereed for years and are willing to help new referees. Read more about it. USSF Memoranda - Amendments to the Laws of the Game and Decisions of the Board. ESSENTIAL reading for all referees, coaches and players. DYSL Parent Code of Conduct This is what DYSL expects of it's parents and all spectators at games. We want to continue to create a positive environment for our players and this document spells out how we want to do this. Click here for a PDF version of this document. DYSL Parent Referee Abuse Policy DYSL had empowered its referees to better control the behavior of spectators at games. They have been told to use the policy described in this document ONLY as a last resort after working with the coach and spectator. But we WILL enforce this with parents that are way out of hand and who make games miserable for players, referees and other spectators. Click here for a PDF version of this document. Officials: If you need to report a send off (red card ) that was given in a CCSL Coast or Bay Division match click here. Fill out the web based form, hit, submit and a pdf of the send off report will be emailed to you with additional instructions. Please do this within 24 HOURS of the match. You should contact the referee assignor in the League that the send off was given and report the incident. NorCal - Please report any incidents (like red cards, unsportsmanship behavior, etc...) online at www.norcalreferees.com. Question: Is there any place I can look to see the status of the red cards? Question: Sent off, How do I get my pass back? If you are a player or coach that received a send off (red card ) in a CCSL Coast or Bay Division match, click the above links to a listing of all send offs given in CCSL & NorCal for this season. The pass for CCSL will be sent to your League President or send off coordinator and will be returned to the team when the suspension has been served. Please allow 48 hours for the send off to be posted. Referees do not keep the passes for NorCal games. Questions? - Contact the DYSL Referee Coordinator for all DYSL referee related questions.